Shuji Nakamura: Developments of InGaN-based double hetero-structure high brightness blue LEDs and future lighting - Ludwig Boltzmann. Measure information. It is perfectly clear in Alfred Nobel’s will, the Nobel Prize Committee awards Nobel Prizes in Physics for “the most important discoveries or inventions within the field of physics” – not for the development of manufacturing technologies. Shuji Nakamura explained these facts on numerous occasions to Japanese media, and also today at the 7th Ludwig Boltzmann Forum. It is difficult to understand why Japanese media and Government organizations did not take this information in. 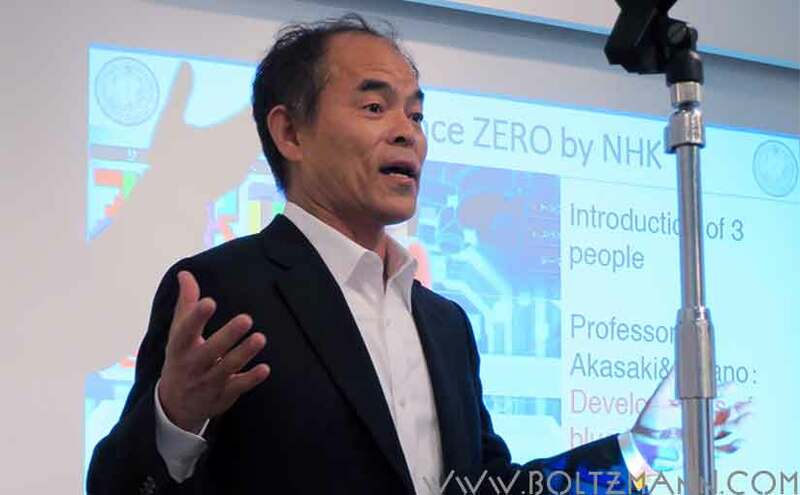 Clearly there is a disconnect between these major Japanese media organizations, two major Japanese Government Research Organizations NEDO and JST and reality regarding the reason why Shuji Nakamura was awarded the Nobel Prize in Physics 2014. Metal-Insulator-Semiconductor (MIS) devices achieve relatively low intensity, weak light emission at the metal / insulator / n-type or p-type semiconductor interface, thus only n-type or p-type doping is necessary. In the case of GaN, n-type GaN was first demonstrated by Maruska in 1973 (H. P. Maruska, D. A. Stevenson, J. I. Pankove, Appl. Phys. Lett., 22 (1973) p 303-305. In these MIS GaN LEDs visible violet electroluminscence was observed, however it was too dim for practical applications, and the necessary voltage was too high for practical application – 15 Volt. p-type GaN and InGaN was demonstrated by Akasaki and Amano with electron beam annealing, and the real breakthrough was by Shuji Nakamura by annealing in Nitrogen gas. On October 20, 1993, the Japanese Journal Nikkan Kogyo announced that “MIS type blue LEDs with a brightness of 200mCd were developed by Toyoda Gosei Co Ltd through industry-University cooperation funded by Japan’s Science and Technology Agency (JST). However, both the MIS LEDs demonstrated by Maruska et al in 1973, and those introduced by Toyoda Gosei in 1993 were too weak for real applications. Another intermediate step in development are p-n junction LEDs, without double heterostructure. Such LEDs also have relatively low light efficiency, since electrons and holes have small overlap and therefore low recombination probability. The quantum confinement of electrons and holes in the same location in space is necessary to achieve high recombination efficiency and thus high brightness. For high brightness GaN LEDs it was necessary to develop viable n-type / p-type InGaN heterostructure LEDs. This was done by Shuji Nakamura, and for example announced by the Japanese Journal Nikkei Sangyo on November 1993: “p-n junction InGaN double heterostructure (DH) LEDs with a brightness of more then 1000 mCd were developed by Nichia Chemical Industries Ltd”, when Shuji Nakamura was at Nichia from 1979-1999. 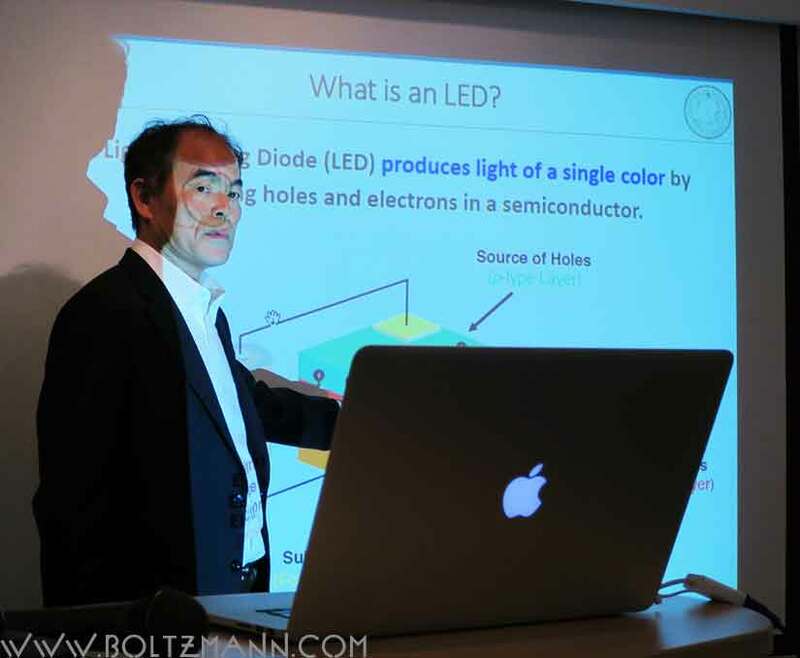 It is for the invention and development of these LEDs that Shuji Nakamura was awarded the Nobel Prize. Introduction by Professor Per Delsing, Chairman of the Nobel Committee for Physics. 1. Introduction: What is an LED? Light emitting diodes (LED) produce light of a single color, in a narrow frequency interval (e.g. red, yellow, blue, green) by combining holes and electrons in a semiconductor. To produce white light needed for lighting, either LEDs of different color can be combined, or blue light can be converted into white light using yellow phosphor. Approx. 40% electricity savings (261 TeraWatthours) in USA in 2030 due to LEDs. 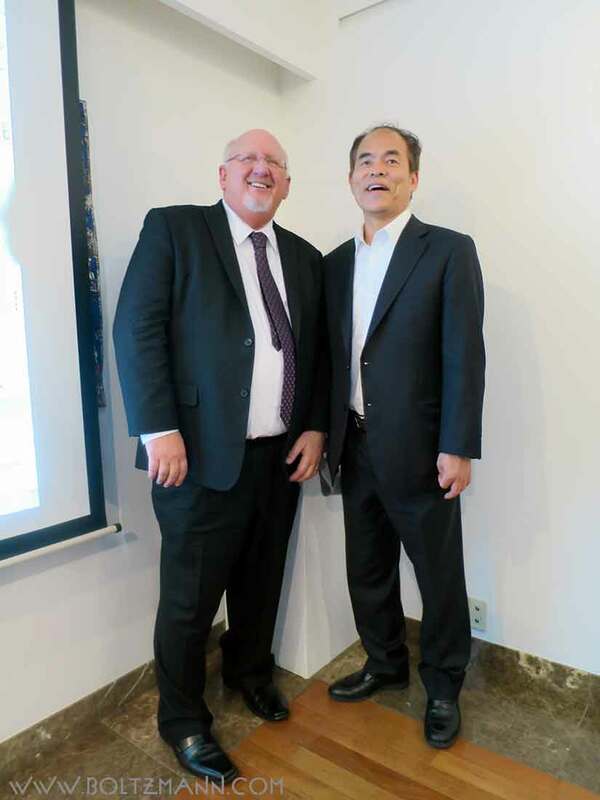 InGaN LEDs eliminate the need for 30++ 1000MW power plants by 2030. InGaN LEDs avoid generating about 185 million tons of CO2. ZnSe can be grown on GaAs substrates with 0% lattice mismatch and few dislocations. GaN grown on Sapphire (Al2O3) has a 16% lattice mismatch leading to a high defect (dislocation) density. 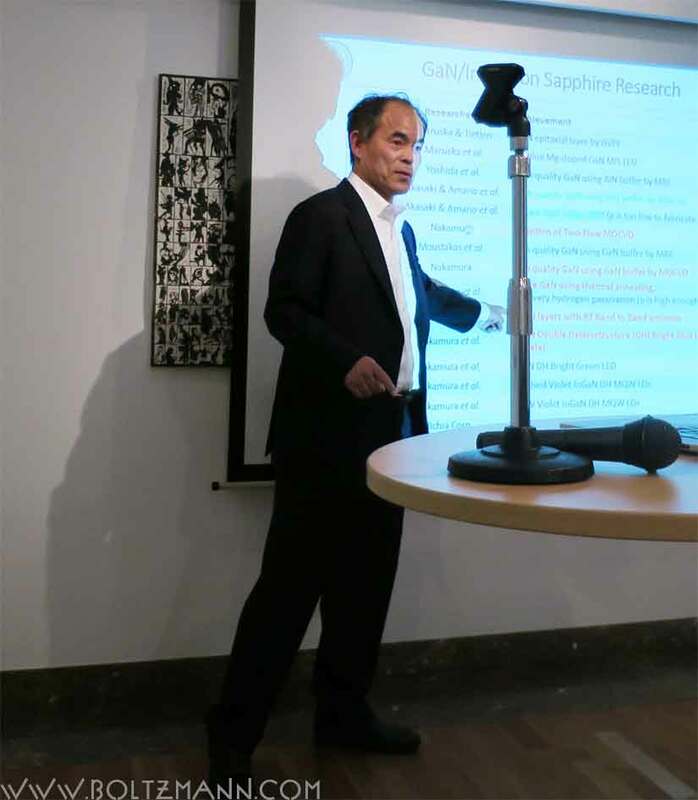 GaN research was actively discouraged: “GaN has no future”, “GaN people have to move to ZnSe material”…. 1989 was the starting point of Shuji Nakamura’s research. 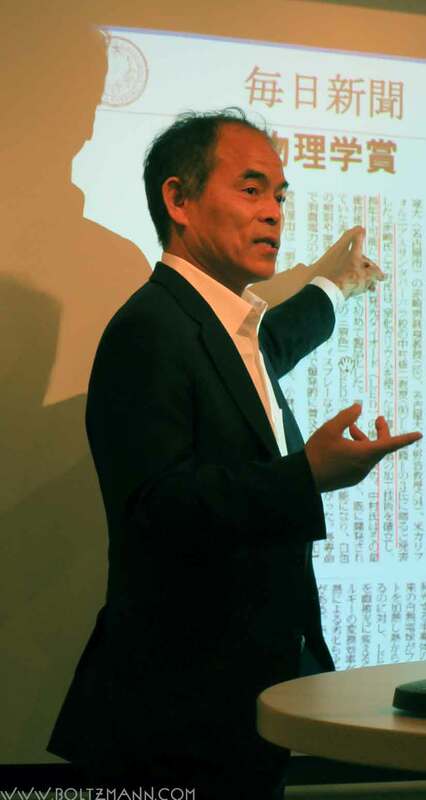 Based on his experience at University of Miami, Shuji Nakamura wanted to achieve a PhD degree by writing research papers. The GaN field had the advantage that there were very few researchers and papers, so it was a great topic to publish lots of papers! Working at a small company the budget was small, and there was only one researcher: Shuji Nakamura. It was commonly accepted in the 19970s-1980s, that LEDs need dislocation density < 1 x 10^3 cm^-2. 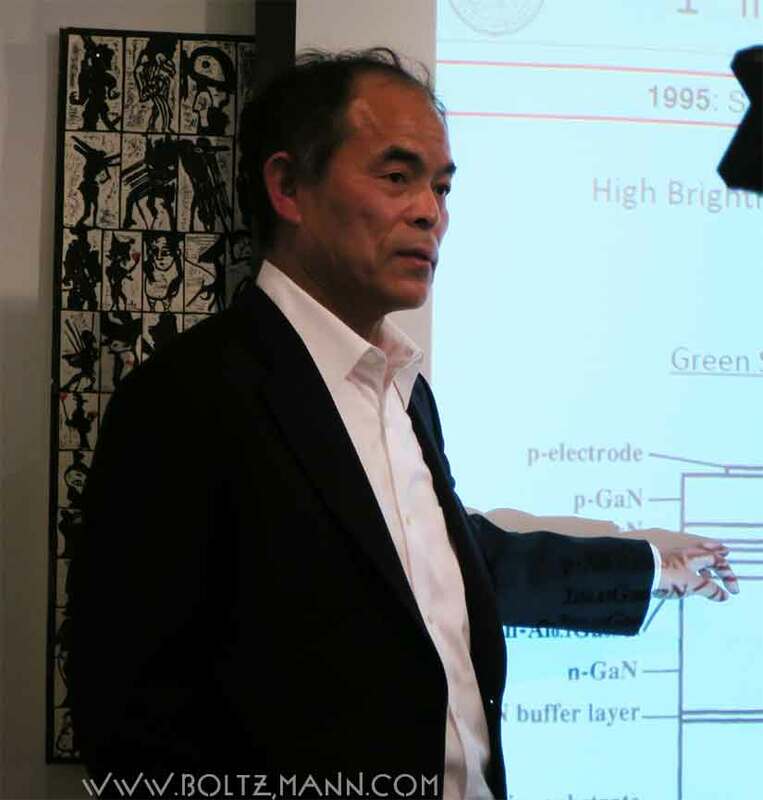 Shuji Nakamura never thought at that time that he could invent blue LEDs using GaN…. Before the 1990s, GaN was grown using conventional MOCVD systems, as described for example in H. Amano, N. Sawaki, I. Akasaki, Y. Toyoda, Appl. Phys. Lett. 48 (1986), 353-355. Conventional MOCVD systems have high carrier gas velocity (about 4.25 m/s), poor uniformity, poor scalability, poor reproducibility, poor control. An AlN buffer layer was introduced to create crack free GaN growth, however, Al causes significant problems in the MOCVD reactor. To overcome the problems of conventional MOCVD, Shuji Nakamura invented “two-flow MOCVD” where a second “subflow” vertical to the surface of the substrate gently “pushes” the gases down onto the substrate and improves the thermal boundary layer: S. Nakamura et al, Appl. Phys. Lett. 58 (1991) 2012-2023. Two-flow MOCVD enables the reproducible growth of uniform, high quality GaN. Shuji Nakamura told us, that two-flow MOCVD was his most important invention. With this new two-flow MOCVD method, Shuji Nakamura grew the first MOCVD GaN buffer layers on 2″ Sapphire substrates, and achieved the highest Hall mobilities reported at that time: S. Nakamura, Jpn. J. Appl. Phys. 30 (1991) L1705-L1707. S. Nakamura et al., Jpn. J. Appl. Phys. 31 (1992) 1258-1266. Previously all researchers used an atmosphere containing H+ to anneal p-type GaN, which was passivated by this process. Shuji Nakamura discovered that it was necessary to anneal in a H+ free atmosphere to achieve p-type GaN. Akasaki and Amano developed p-n GaN homojunctions. These have good crystal quality, but very dim light emission, are very inefficient, power output is below mW, and the emission is around 360nm in the Ultra-Violet (UV). These structures are not suitable for practical LEDs. To overcome these difficulties, double heterostructure are necessary, which were invented by Z. I. Alferov and H. Kroemer, who were awarded the 2000 Nobel Prize in Physics. Double heterostructures (DH) create a quantum well, were electrons and holes are confined, high carrier concentrations are achieved and the radiative recombination rates are enhanced. It is necessary to grow very thin layers to build quantum wells. Growing very thin layers requires very fine control over the growth conditions and high interface quality. Indium introduces strain in the crystal because Indium is about 20% bigger than Gallium. Because of these difficulties, research in the 1970s-1980s could not achieve InGaN of sufficiently high quality for room temperature band-to-band emission. Shuji Nakamura’s two-flow MOCVD method succeeded to grow high quality InGaN with band-to-band emission and with controllable Indium concentration, so that the growth of InGaN with different band-gap and therefore controllable color spectrum became possible: S. Nakamura et al Jpn. J. Appl. Phys. 31 (1992) L1457-L1459. With this breakthrough, Shuji Nakamura succeeded to grow the first high brightness InGaN LEDs: S. Nakamura et al, Appl. Phys. Lett. 54 (1994) 1687-1689. Shuji Nakamura could grow the first InGaN quantum well blue, green and yellow LEDs using these methods: S. Nakamura et. al. Jpn. J. Appl. Phys. 34 (1995) L797-L799 and the first violet InGaN Multi-quantum-well laser diode: S. Nakamura et. al. Jpn. J. Appl. Physics 35 (1996) L74-L76. Nakamura, Science, 281 (1998) 956. While red GaAs/GaAsP LEDs where invented in the 1970s, progress in luminous efficiency of GaN and InGaN based green and blue LEDs, invented around 1992-1993 by Shuji Nakamura, is much faster. Today white LEDs far exceed light bulbs and fluorescent lamps in luminous efficiency. USC’s vision: LED based white light is great, laser based white light is even better! Shuji Nakamura, Nobel Prize in Physics 2014 Facts.